You can add attributes to output ports of transformers and assign values to them at runtime. These values take the place of any value otherwise assigned to these ports. Added attributes can be passed on for use by another transformer, or directly to writer feature type attributes. As with any attribute, they can be constants, user parameter references, or expressions involving any combination of other attributes, constants and parameters. Right click on an output port name and select Add Attribute. 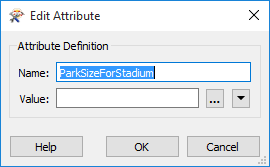 On the Edit Attribute dialog, provide a name for the attribute, and a value. To formulate an expression, click the ellipsis to open the text editor. Alternatively, click the value drop-down indicator to reference another attribute or user parameter, open the text editor, open the arithmetic editor, or define a parameter condition. You may wish to keep an attribute for future reference, without actually passing on its value. In this case, you can disable the attribute. Right click on the attribute and select Disable. The disabled attribute banner turns a lighter shade of gray. 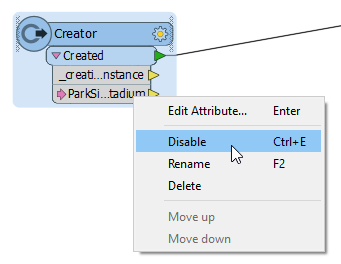 To re-enable the attribute, right-click on it and select Enable.